TOKYO—A defiant Carlos Ghosn accused “backstabbing” former colleagues of conspiring to oust him as Nissan chairman and threatening the Japanese automaker’s future, in a video marking his first public address since his initial arrest last year. Prosecutors took the highly unusual step of re-arresting Ghosn on April 4 on fresh allegations that he used company funds to enrich himself by $5 million. The once-feted executive, who had been out on $9 million bail for 30 days, recorded the video the day before he went back to jail. In the video, shown to reporters by his lawyers in Tokyo, the former Nissan Motor Co. chairman said he was the victim of selfish rivals bent on derailing a closer alliance between the automaker and French partner Renault. “This is not about greed or dictatorship, this is about a plot, this is about a conspiracy, this is about a backstabbing,” Ghosn said. “I am innocent of all the charges that have been brought against me,” he said, without explaining further. Wearing a dark jacket and a white shirt, Ghosn sat at a desk with his hands folded as he looked into the camera and spoke in a calm voice. His hair appeared greyer and his face thinner than before his first arrest in November. 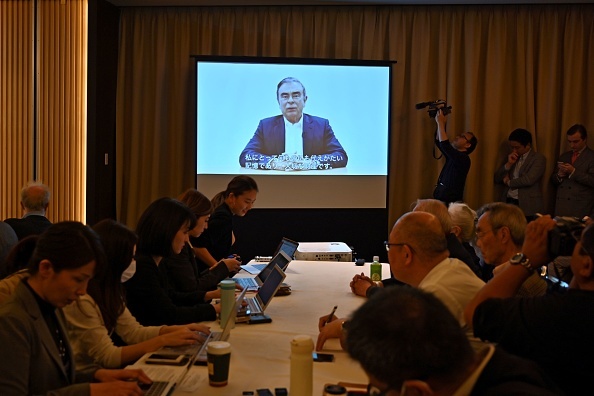 The video, and comments by his lawyer Junichiro Hironaka alleging harsh treatment by prosecutors against Ghosn and his wife Carole, cast Ghosn as the victim of internal rivalries and a Japanese judicial system bent on forcing a confession. The seven-minute clip was, however, edited by his legal team to remove the names of people Ghosn accused of treachery due to legal concerns. The conspiracy, Ghosn said, was born out of fear that he would bring Nissan closer to Renault, also its top shareholder. “There was fear that the next step of the alliance in terms of convergence and in terms of moving toward a merger, would in a certain way threaten some people or eventually threaten the autonomy of Nissan,” he said. Ghosn also took aim at Nissan’s current management, blaming them for three profit warnings and a domestic scandal involving improper vehicle inspections since his departure as CEO in 2017. The lack of leadership is “very sickening”, Ghosn said. Ghosn’s second stint at the Tokyo detention center comes after he served 108 days following his first arrest last year. Prosecutors are acting in a “cruel way” and putting him under intense physical and mental pressure to get a confession, Hironaka told reporters. A spokeswoman at the Tokyo prosecutors office said she was unaware of Hironaka’s comments and declined to comment. Hironaka has previously criticized the move by prosecutors to confiscate Ghosn’s belongings, including his mobile phone and trial documents, along with the mobile phones and Lebanese passport of his wife, Carole, who was present when prosecutors entered their home early in the morning April 4. The lawyer said on April 9 that Ghosn’s wife, who left Japan last week, did so out of concern for her own safety, adding she intended to ask the French government to help her husband. But, France’s finance minister said political interventions might not be the best way to help Ghosn. The case has rocked the global auto industry and also shone a harsh light on Japan’s judicial system, which critics refer to as “hostage justice” as defendants who deny their charges are often not granted bail. Under Japanese law, prosecutors are able to hold suspects for up to 22 days without charge and interrogate them without their lawyers present. Ghosn has been charged with under-reporting his Nissan salary for a decade and of temporarily transferring personal financial losses to Nissan’s books. However, the latest allegation is potentially more serious, as it could show he used company funds for his own purposes.